I am so excited to be hosting this amazing giveaway with The Picket Fence baby stores Pittsburgh! If you're on the lookout for a super cute or unique gift for yourself, your baby or toddler, or your home, this is a great shop to visit! Being a new mom, and even more so a mom to a girl, I find myself buying clothes for her pretty regularly. Do I have a shopping problem? I'd say no, Joe would say (or did say) that FedEx should have a terminal at our house for how often they deliver to us... (insert eye roll emoji here) but when I was given the opportunity to host a giveaway with The Picket Fence I jumped on it because it gave me the opportunity to get another perfect little something for my girl! Gone are the days of buying everything for myself. Do I still? Yes, but the cart either has more for her than it does for me or I'm shopping somewhere that doesn't offer baby stuff! I could not resist this adorable seersucker romper! I cannot wait to pair it with a couple of bows and sandals this summer! The material is so soft and the colors are perfect! The Picket Fence is giving one lucky winner a $50 credit towards their shop. Be sure to leave a comment for your official entry & use the Raffelcopter below for more entries! I would love to win the gift certificate. I have two precious grandsons, Ashton and Anderson who I love to buy clothes for. Georgia is adorable! I love seeing pictures of your sweet little girl. She is so adorable!! Adorable! Love shopping for a baby girl too! This store looks amazing! And that romper.. on my. 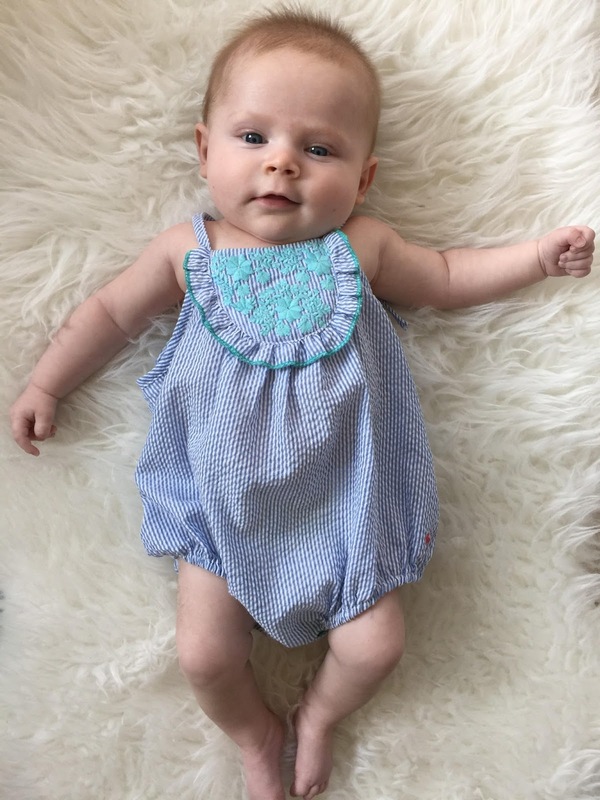 I am loving rompers for my daughter this year. I'd love to win this gift card! It's amazing how once you have a baby you end up buying stuff for them constantly and really don't think about yourself too much anymore. At least their clothes are much cheaper..haha She is so cute! I find it all too easy to shop for my girls (and my nieces and nephews...), especially living 10 minutes from an outlet mall! So cute!!! She's grown so much! I've heard great things about picket fence! All their items are adorable! First baby (also a DEIVF baby) due in October, and we find out if baby is Charlie or Hannah on May 22! This gift card would be awesome to buy the FIRST baby thing (crazy - I haven't bought a single baby thing yet!). She's such a doll!! Our little girl will be here any day now and I CAN NOT wait!! Playing dress up is going to be the best! My goodness she is just the sweetest!! What a cute romper! Adorable clothes and accessories for the little ones are hard to resist sometimes!